Since buying a complete darkroom setup last fall, I’ve been slowly working toward making my first wet prints at home. On the day after Thanksgiving, it happened. I actually made my New Year’s Resolution for 2016 to successfully produce an acceptable print by year’s end. I could’ve sworn I posted it on this blog, but I can’t find it. It took me nearly 11 months, but I finally made it. I’ve still got some fine-tuning I want to do for this particular print — more contrast and slightly less exposure — but I’m really pleased with the fact that I made this thing myself, at home. I’ve had a ton of advice from buddy Craig Pindell, my friend Mike, and other members of the #believeinfilm community, and I’ve watched YouTube videos and read articles and pamphlets. In the end it all worked out just fine. I spent spring and summer heavily involved in testing cameras for review and starting to thin the immense herd that is my camera collection. I did some more serious photography this fall and even into what I would normally consider winter since the weather maintained unseasonable warmth until the middle of November. Now that winter finally appears to be arriving, it’s the ideal time to get going in the darkroom. The early sunsets and long nights will afford me lots of time to practice. The bug struck me rather suddenly a couple of days after the first snow fell — about ten days ago — and I felt compelled to get going. What held me up so long? 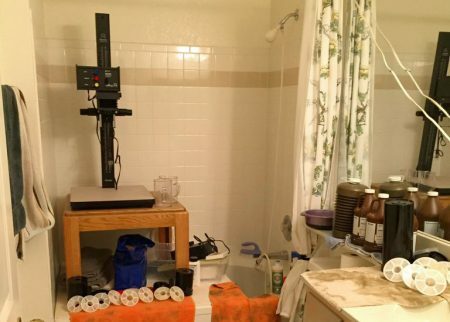 Well, my first attempt to light-proof the bathroom I’ve converted into a darkroom using foam weather-seal tape failed miserably. It probably would have been light-tight, but I couldn’t figure out a way to mount it that allowed the door to close and stay shut. Disheartened, and still missing a few things — mostly a workable solution for washing prints — I put it off and did more reviewing. I bought a large cat litter pan and drilled a drain hole in it, and installed a DeHypo Turbulator over the hole. I connected it to the tub faucet and tested it — it works as advertised! Then, last Monday, I found four boxes of photo paper at a thrift store for $15. I figured the odds were that it was shot. The boxes were mostly full but had been opened, and probably inspected by previous owners or thrift store personnel. I decided it was worth the chance, since my goal was only to have practice material, and it paid off. After mixing my chemicals and swapping the safelight into the fixture, I decided to try developing an unexposed (by me, at least) sheet from each box to see what I got. 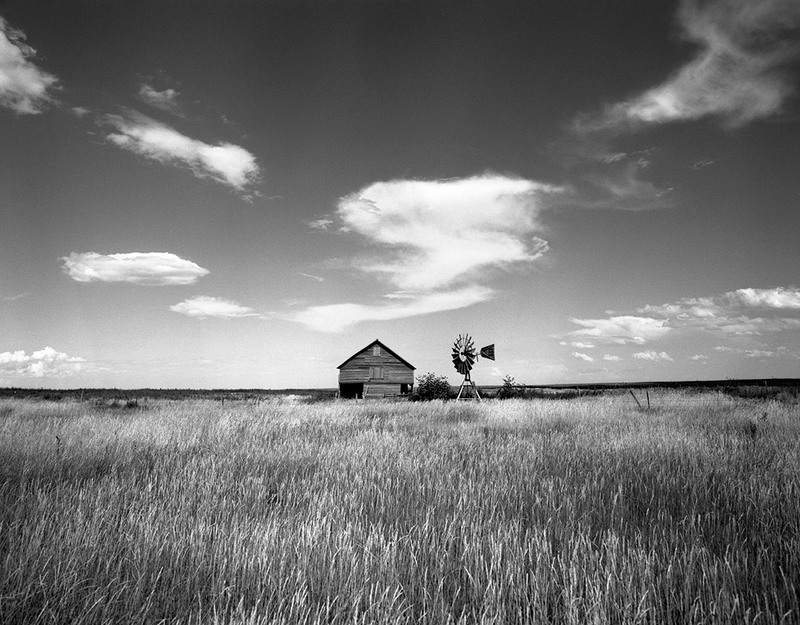 A sheet of Kodak fiber paper went into the developer and within a few seconds it began to darken. In half a minute it was black as pitch. A sheet from the Agfa fiber paper box suffered similar fate, though not as extreme — it’s a pretty close approximation of an 18-percent grey card right now. I also tried sheets from lower in each stack with the same result. But the sheet off the top of the recently-expired 100-sheet Ilford Multigrade RC box did nothing. It stayed perfectly white! 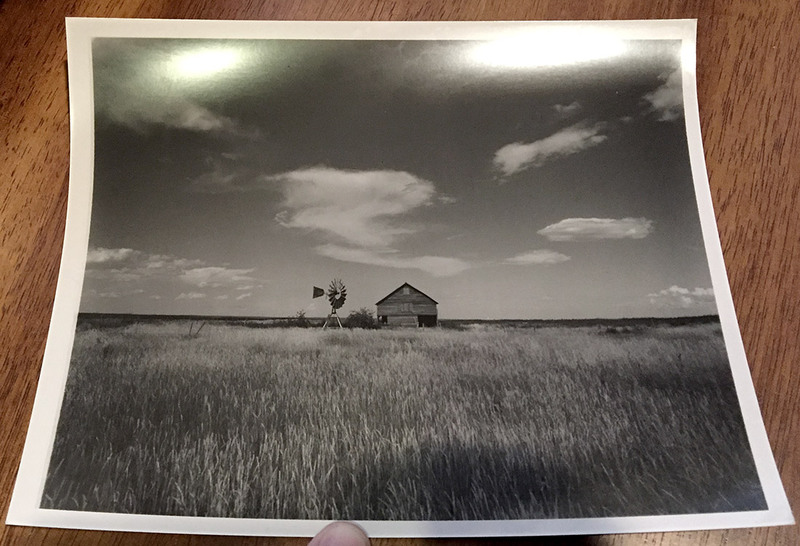 I had already purchased a box of Ilford MG RC paper to play with, but why waste known-good, brand-new paper on my very first efforts, when I was sure to fail several times before producing anything useful? Even if I toss the other two boxes, the $15 total cost makes the box of Ilford paper a steal indeed. I followed the guidelines in Ilford’s booklet to begin with: mixed the chemicals to their specifications and started with what I thought were their times. I made an attempted contact sheet that’s barely recognizable due to overexposure. I tried test strips and got some areas that were less overexposed, but still really dark. I revisited the Making Your First Print pamphlet and realized I’d been doing 3-second increments instead of 2-second, and that the procedure calls for starting at f/8 and then trying f/11 if all strips were too dark. I’d been at f/8 the whole time, so I stopped down. Shortly I could see something that looked reasonably close to what I hoped to get! Ultimately, I produced the print above after spending 6 sheets experimenting. It took 3 seconds of exposure at f/11 with the magenta on my Super Chromega dichroic enlarging head set to 25 (cyan and yellow at 0). It’s a little darker and a little flatter than I want the final print to be, but I’m well on the way. With a little more help from Craig and some advice from Gregory Antikian, I’ve got an idea how to get there. As my darkroom notebook grows more useful and complete, I’ll share notes about what I’ve learned. First off, 3 seconds is too little exposure. There’s no time to dodge or burn, for one thing. Based on that input, I have come up with a revised set of guidelines for creating the light colors produced by contrast filters, which will also reduce the light output from the enlarger slightly, which I believe will achieve both of my aims (lighter print, higher contrast) and produce a superior print. Next up: back into the darkroom to perfect this print. Which includes flipping the negative over, because I just realized it’s backwards. The windmill should be to the right of the barn. D’oh!